The Most Wonderful Christmas Decorations Of The Year! Looking for some easy and inexpensive Christmas decorations this holiday season? You've come to the right place! Bring joy to your home with this list of wonderful Christmas decoration ideas you can make even at the last minute. Have fun! Kickoff the holiday season with this list of Christmas decorating inspiration for a memorable Christmas celebration. So, here are the best DIY Christmas projects all in one post so you can easily prepare your home to welcome the holiday season. Hey, DIY'ers! It's that time a year again! Time to break out your best, most festive decor for everyone's favorite holiday – CHRISTMAS! Whether you want your home to sparkle with cheer or you prefer a more rustic styling for your hall decking, I have you covered with these projects. Transform your home into a winter wonderland with our fun, festive, and fabulous Christmas home decor ideas! 2. Make Your Mantel Shine! Fireplace mantels are always fun to decorate, especially with Christmas decorations. It creates a fun and festive environment in any home. In case you haven’t completed your Christmas mantel decor, I have some great mantel decorating ideas you can try. Having a great mantel decor doesn’t have to be pricey, I have some that are almost free for you to make. So what are you waiting for, go to the link and find the Christmas mantel decor for your home and find out how to decorate a mantel today! 3. Trim Your Tree With Some DIY Fun! I love this time of year when the smell of hot chocolate, flurries in the windows, and gathering around the fireplace with friends and family. For me, that the best things you can do for the holidays. We all have days when it doesn’t feel like this. The holidays always sneak up too fast and you tend to get lost so easily in the Christmas noise. Why not take a moment this year and make some memories? Making some homemade Christmas ornaments is a good idea! Your kids don’t have to be the only ones getting all the fun this year. You can add to their favorite scraps of paper and fabrics your own rustic Christmas ornaments this year with these ideas for awesome DIY Christmas ornaments to make your Christmas tree a little merrier! 4. Top Your Tables With Festive Fun! Christmas is just around the corner! This is the most festive of holidays and what better to complete your Christmas decorations than to make Christmas centerpieces! Having an amazing stand-out decoration doesn’t always have to be expensive. You just need to have some creativity and a few supplies and you’ll be well on your way to making your DIY centerpieces. I have some inexpensive and easy to make Christmas centerpiece ideas you can choose from. It goes from cute to classy and best of all, you only need a chunk of time to do them. So let’s get the craftiness going and start on these easy Christmas table decorations! 5. Dress Up Your Mantel With Cute & Custom Hangers! 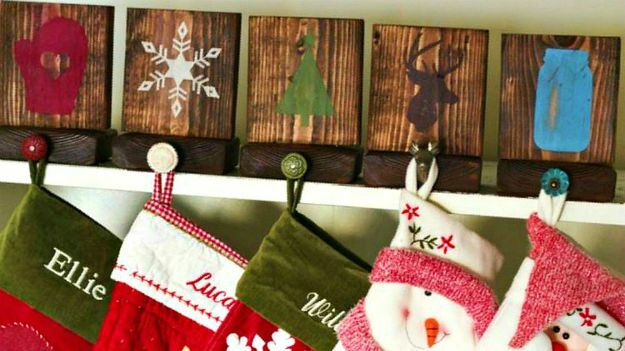 Warm, easy, and rustic, these beautiful stocking hangers will bring charming looks to any mantle. With only a few simple supplies and about an hour of work, you can make these lovely Christmas accents just in time for the Christmas season! This would be the perfect Christmas craft! 6. Trick Out Your Tree With A Tiny Terrarium! Create DIY ornaments featuring these glass-enclosed gardens that will make your Christmas tree truly unique, dazzling, and merry. Using a few budget-friendly materials and some fresh plants, you can easily make your own glass terrarium as personalized Christmas ornaments. It’s more fun and creative than the usual store-bought and generic Christmas ornaments. I hope this list has helped you complete your Christmas decorations! With Christmas a few days away, you still have time to make a couple of these decor ideas that will bring joy to your home for the entire holiday season. And as always, happy crafting! What Christmas decorating ideas will you make for your home? Let me know in the comments below! Still in the mood for more holiday crafts? Check out 12 Totally Unique DIY Christmas Decorations!